Legit Cherub Rock in DLC folder but does not appear in Song List ? 1. I have legit versions of RS14 and Cherub Rock ...all game files verified and show as "installed" in Steam Library. 2. I "refreshed" my computer back to factory original settings and reinstalled RS14 / Steam. 3. Cherub Rock shows up in my DLC folder, but does not show up in the Song List. RS14 runs fine, otherwise. 4. I have NOT added the "magic" DLL file that makes CLDC's work...if Cherub Rock won't even show up in the Song List, there's no sense in proceeding further with the CLDC stuff until problem is solved. 5. I am not running any antivirus / malware / blockers...nothing... my PC is a clean slate. Why won't Cherub Rock show up in my song list ? (I wrote to Ubisoft a week ago ... no response). Thanks in advance for any suggestions...I've been pulling my hair out for 2 weeks trying to fix this. Point 4 is completely wrong. You don't need Cherub Rock for CDLC anymore. I haven't started rebuilding my CLDC library yet...My issue is that I have a purchased copy of Cherub Rock in my DLC folder, it shows as "installed" in my Steam library, all files are verified, but it doesn't show in my Song List when I open RS14. (Only six songs appear in my Song List now after I reinstalled RS14...I thought there were a lot more than that). I also have a purchased copy of Black Sunshine / White Zombie that is in the DLC folder / Steam Library but doesn't show in the Song List. I can't start messing with CLDC's again until I fix this issue. Do you have some filter on by accident? take a screenshot of your song list so we can see. There are a lot more than 6 original songs. @xzombeex The song list is filtered by Favorite so you don't see all songs!!!! 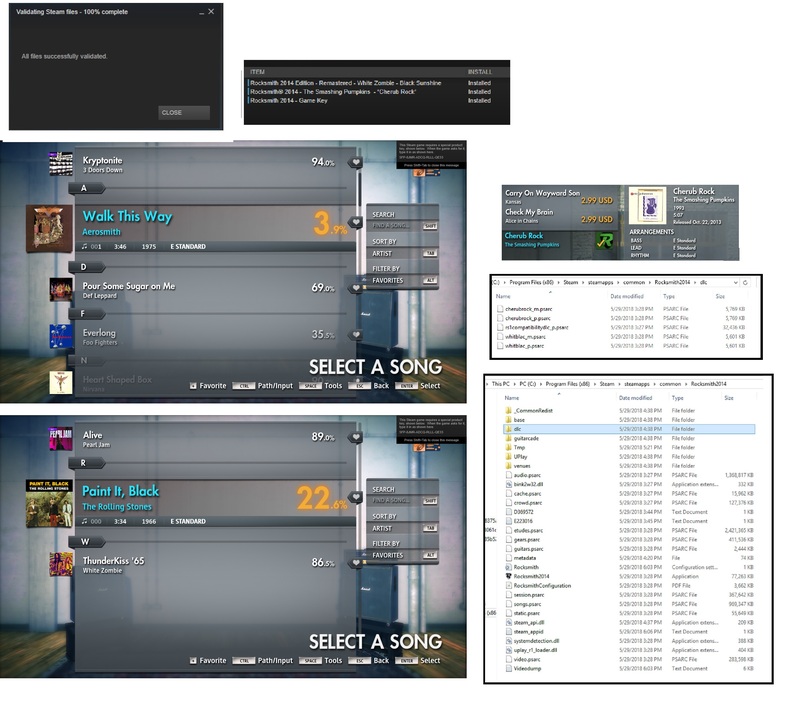 press ALT and change it to show all songs and it should be fine. THANK YOU !! I've been sorting songs by artist or tuning for the past four years...didn't even notice I bumped the "alt" button for "favorites". I had the same question. so i do not need to buy Cherub Rock anymore to use CDLC? Since when? just only put the dll file in the right directory and thats it? @gwbuiter That's wrong but not entirely incorrect, you don't absolutely need cherub rock for CDLC but you DO need ONE official DLC to use the ID. Since all of the CDLC available in our database use Cherub Rock ID, it's easier for all user to own Cherub Rock and not have to do anything more but you can still spend time to change ID of the CDLC you download to the ID of the official DLC you own if you want to.